I found this recipe in the March 2012 issue of Food and Wine magazine and adapted it to my own liking. 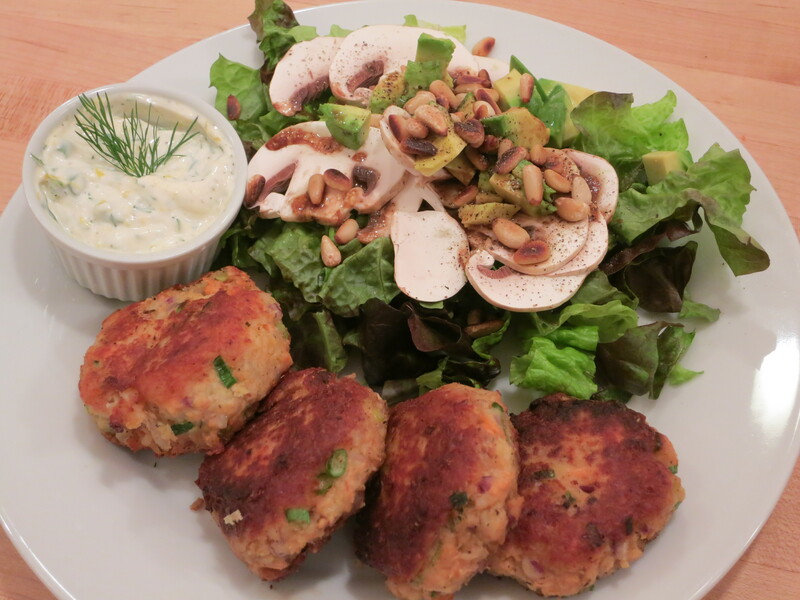 I don’t care for crab or salmon cakes with too much filler where you lose the taste of what I believe should be the main ingredient…the seafood! I also used leftover salmon that I had baked the night before for dinner. 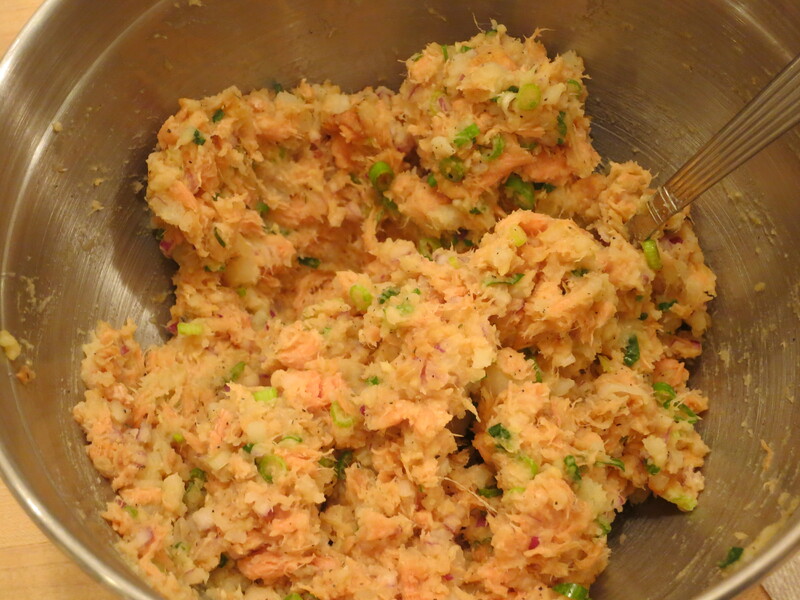 If you’re using raw salmon from scratch, the directions are below otherwise skip to step 2. Preheat the oven to 350°. 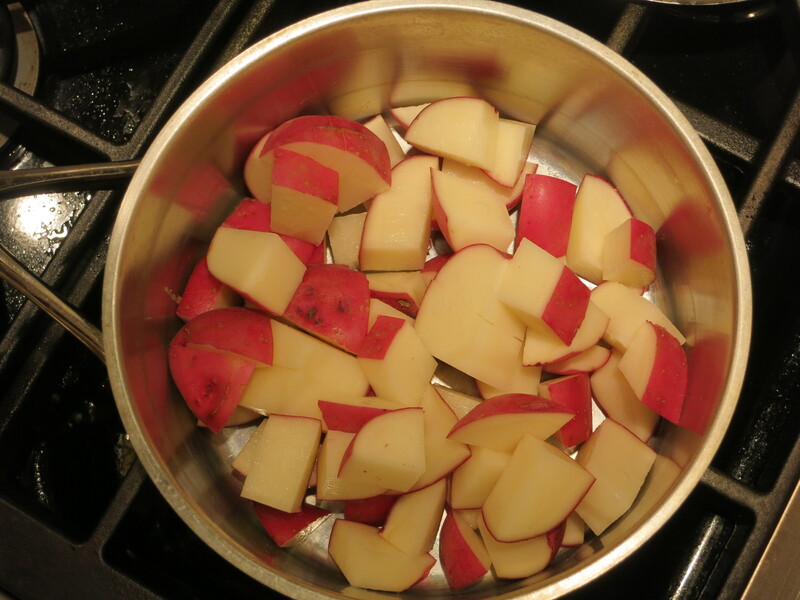 In a large saucepan, cover the potatoes with water. Add a large pinch of sea salt and bring to a boil. Simmer over moderately high heat until the potatoes are tender, about 20 minutes. Drain and let cool slightly, then peel. Transfer the potatoes to a large bowl and mash. Meanwhile, put the salmon on a lightly oiled rimmed baking sheet and season with salt and pepper. Bake for about 15 minutes, until the salmon is medium-rare inside. 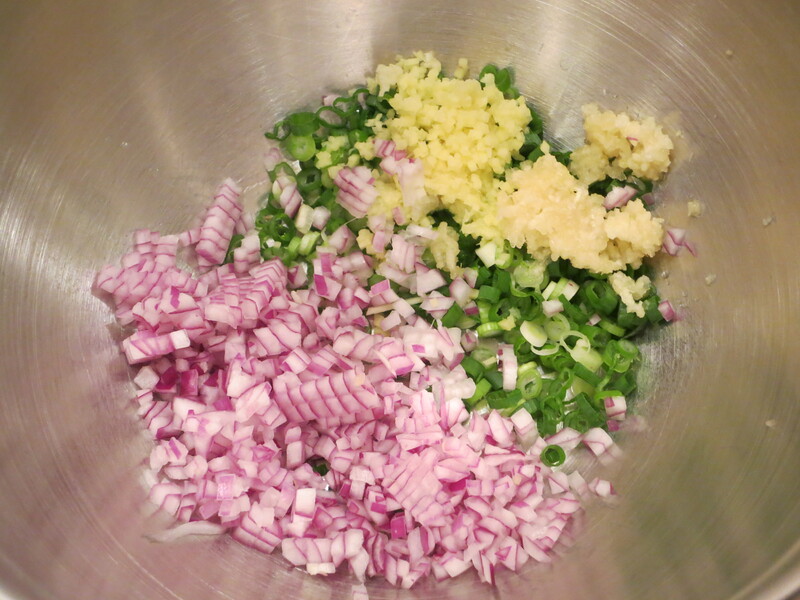 Gently flake the salmon and add it to the potatoes along with the scallions, eggs, garlic, ginger, onion, tamari and sesame oil. Mix well, then season with salt. 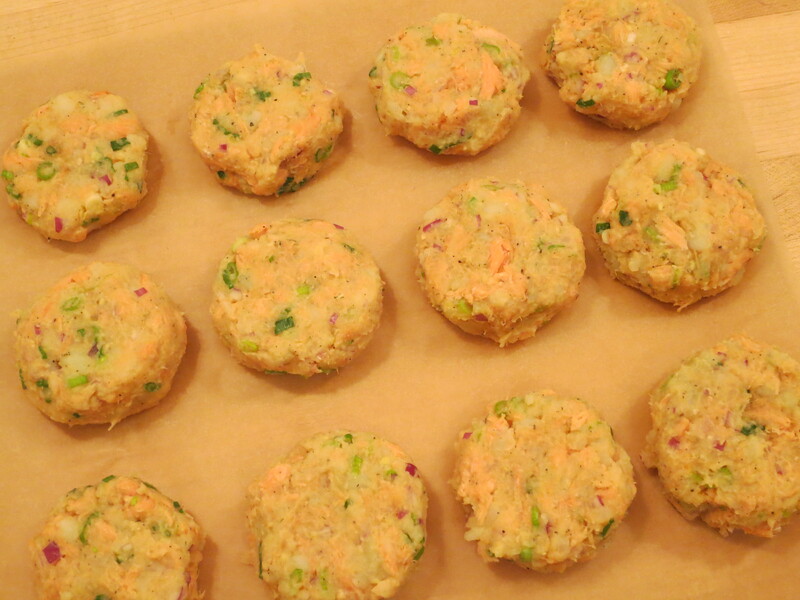 Form the potato mixture into fourteen 1/2-cup patties. In a large nonstick skillet, heat 1/4 inch of safflower or sunflower oil until shimmering. 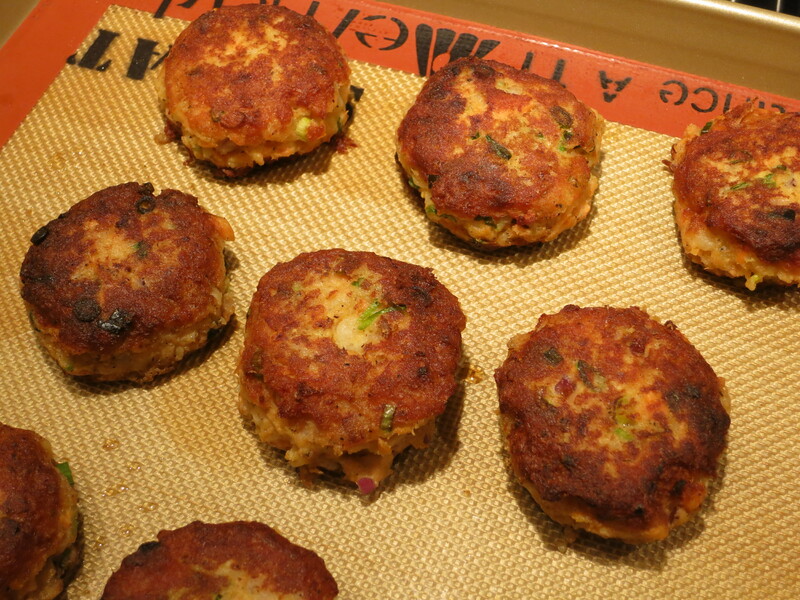 Working in batches, fry the potato cakes over moderately high heat until browned and crisp, about 2 minutes per side. Transfer to a large baking sheet. Repeat with the remaining potato cakes, adding more oil and adjusting the heat as necessary. 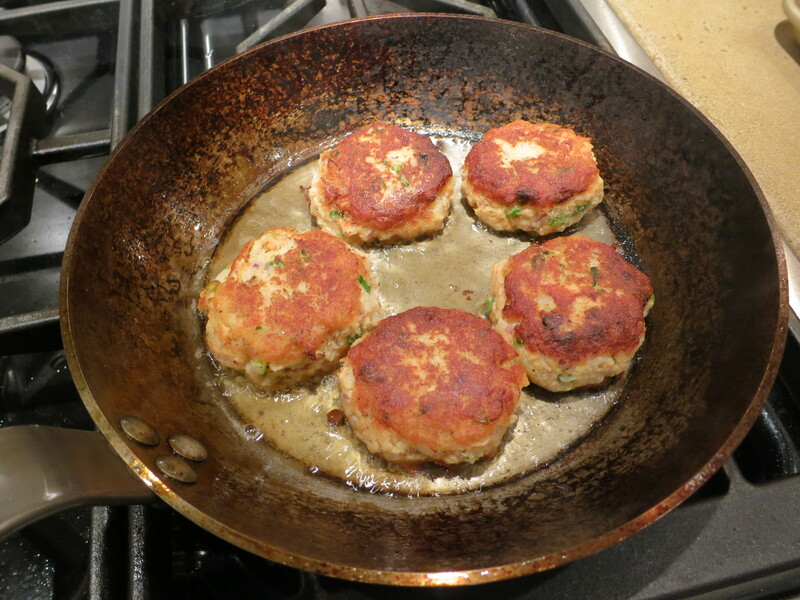 Bake the salmon cakes for about 15 minutes, until heated through. Serve with the Dill Sauce and enjoy!